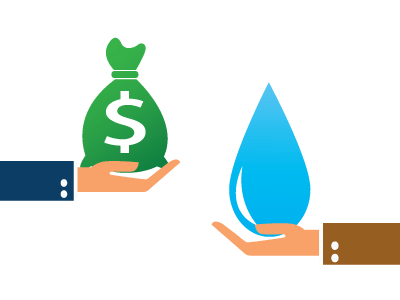 Wastewater Blog: Can Privatization of Water and Wastewater Utilities Really Save Communities Money? Issues converging across the country have renewed the push to privatize water and sewer utilities, including aging infrastructure in need of costly repairs, the call for reduction in spending, residents feeling overburdened with high property taxes…the list goes on and on. There is no doubt we have a serious need to upgrade our aging infrastructure, but the promise of privatization seems too good to be true at a time when local governments are looking for ways to fill other budget holes without raising taxes (or user rates). The truth is, it is too good to be true. The infusion of money into the local government from the sale or lease of the utility. The additional funding that goes to the local government from the sale of the utility can fill budget holes and make up for deficits without raising taxes, but they do raise user fees. The private sector must get a return on their investment so the initial payment to the government entity is really a long-term loan to be repaid by the users of the system. These one-time infusions of money only provide short-term benefits as opposed to long-term, viable solutions for financially unstable local governments. Private sector companies will run the utility cheaper and more efficiently than the public sector ever could. This remains simply a generalization based on the perception of government inefficiency compared to the private sector, which will squeeze the most out of every dollar it can, to get the most bang for its buck. In fact, government agencies often have access to lower interest rate loans and other sources of funding. The “cost of money” can be a critical factor in keeping costs down when you are talking about project costs in the millions of dollars. Government agencies do not pay income taxes and are not meant to be profitable. Private entities on the other hand must pay income taxes and provide an adequate rate of return to their shareholders. Government can run less expensively than the private sector. Shifting the utility to private sector will eliminate burden on the taxpayer. This is blatantly false. Depending on how the existing public system is structured the residents either pay for the system via taxes or user rate payments. A private takeover of the utility would simply result in those same rate payments or portion of the tax rate being paid to the utility, rather than to the municipality or local utility authority. One of the most obvious concerns with privatization of water and wastewater utilities is taking an essential service out of the public trust, and placing it into the hands of a private company, creating a de facto monopoly. Access to clean water and effective sewer management is essential to life. By keeping these utilities in the public sector it ensures a level of accountability to the residents; employees and managers of the utilities are accountable to elected officials, who in turn are accountable to the residents. If there is a problem you can be sure residents will voice their concerns to their elected officials. Private companies are only accountable to various regulatory and oversight boards that do not have the same level of accountability to the public. Their first responsibility is to the stockholder and the stockholder’s investment. In addition to accountability, another concern with privatization is the myth of lower costs and rates. Consider the simple and obvious fact that a private company’s top concern is making money. Upon taking over a utility we are told they will lower costs and rates through improved efficiency, after all they want to make as much money as they can, so there will be little waste. However, consider they are now in charge of maintaining AND upgrading a system while also making a profit. This company just paid a lot of money to buy this utility; surely they’ll have to recoup that cost, which means they will need to increase rates. They have promised to come in and upgrade the system, which will come at a cost, so just like the public sector would have done, they will increase rates to pay for the upgrades. However, the public sector can borrow at lower tax-exempt rates. And lastly, let’s not forget they didn’t buy this asset just for kicks; they want to make money on it. So after increasing rates to recover their capital costs of buying the utility and increasing rates to cover the cost of infrastructure improvements they still need to increase rates so they can actually make a profit. If the public sector still ran the utility they would simply have raised rates to cover the improvement costs and nothing else. Privatization is certainly not the home run it is often presented to be. In many ways it is just a short-term answer that ignores the real long-term issues involved in both aging infrastructure and struggling municipal finances.